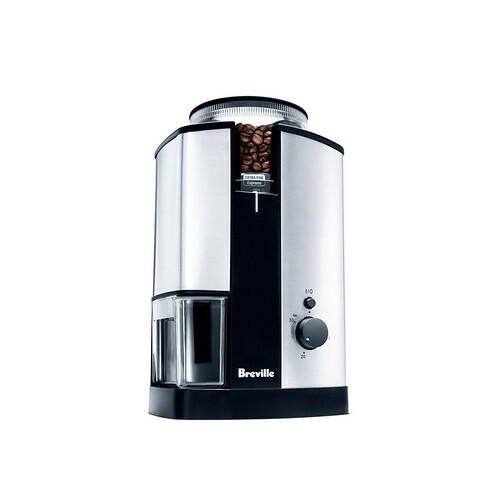 The Breville Conical Burr Grinder – A burr grinder that delivers a precise and even grind for any type of coffee beverage from espresso to French press. The perfect alternative to imprecise blade grinders. Generates minimal heat to the coffee bean to minimize flavor loss. Sleek stainless steel casing. Easy-to-use settings. Holds up to ½ lb (230 grams) of beans. A. Bean Hopper - holds up to 7 oz. of coffee beans. B. Stainless steel housing. C. Grinds container. D. Cord wrap. E. Non-Slip feet. F. Bean Hopper Lid - with transparent window. 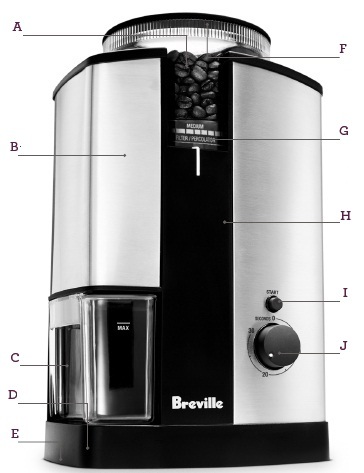 G. Grind Selector Control - with suggested coffee style settings. H. Conical Burr Grinding - inside the grinding chamber. I. START/STOP button. J. Timer Selector dial.